In Quebec and Canada, immigration policies are designed to attract “the best and the brightest.” Once migration occurs, however, the “brain waste” is challenging. This research focuses on the professional trajectories of international medical graduates (IMG) who migrate to Quebec. The main goal is to understand why certain individuals of a similar occupational group can easily access the doctoral profession while others cannot. Following a qualitative approach, and stemming from IMGs’ perspectives, this article explores the interplay of economic, social, and symbolic resources in a context of highly fragmented institutional resources and protectionism. We are critical of the individual-centered approaches that ignore social norms and constraints. 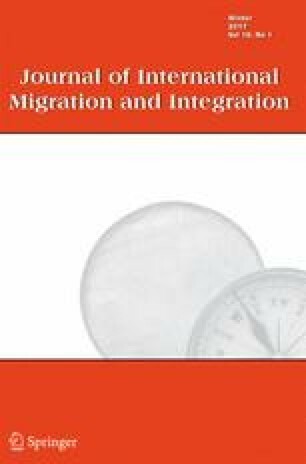 If migrants are free to choose their paths and manner of integration, the “human capital” approach is limited in explaining the heterogeneous pathways within the same professional group. The current structure for professional recognition places unusual constraints on IMGs, whereby some encounter more obstacles than others. The “battle” for professional recognition takes shape in a highly competitive context, one which—although presented as a neutral process—is underlain with ideological, relational, and subjective currents. Thanks to the Social Sciences and Humanities Research Council of Canada, to the CHU Sainte-Justine Foundation & Foundation of stars, to the Department of Anthropology at the University of Montreal for their support, as well as to all the participants. Our gratitude to Vincent Duclos for his attentive reading of the first draft and to the reviewers of JIMI whose constructive comments helped to substantially improve the manuscript. CaRMS (2013). IMGs by Region of Graduation 2013 R-1 Match. www.carms.ca Accessed 15-11-2013. Collège des médecins du Québec (CMQ) (2014). Statistiques. Les médecins du Québec - Répartition au 31 décembre 2013. www.cmq.org. Accessed 23-10-2014. Commission des droits de la personne et des droits de la jeunesse du Québec (CDPDJ) (2013). Les médecins formés à l’étranger toujours victimes de discrimination. Communiqué. www.cdpdj.qc.ca/fr/medias/Pages/Communique.aspx?showItem=584. Accessed 2013-10-02. Ministère de l'Immigration et des Communautés culturelles (MICC) (2013). Un Québec fort de son immigration. Plan d'action pour la francisation et l'intégration des personnes immigrantes (pp. 5): Gouvernement du Québec. www.midi.gouv.qc.ca/publications/fr/planification/PlanActionQuebecFort.pdf. Sow, D. (2010). Un autre discours sur l’intégration des médecins diplômés à l’étranger est possible. http://doudousow.wordpress.com/2010/11/17/un-autre-discours-sur-l%E2%80%99integration-des-medecins-diplomes-a-l%E2%80%99etranger-est-possible/. Accessed 12-05-26.